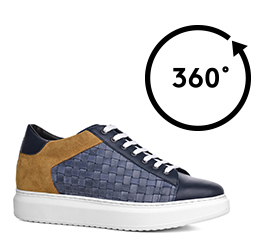 Low-top elevator sneakers with upper made of three fine leathers: blue calfskin on the toe and heel tab, hand-painted blue braided calf leather on the sides, yellow ochre suede detail on the heel counter. The sole is in natural rubber. A chic-casual model with an iconic design and an invisible inner elevator system that can increase the total height by 2.6 inches (6.5 cm) in style.